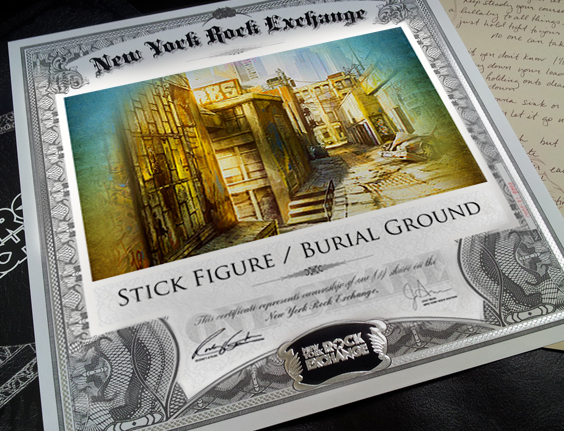 To celebrate Stick Figure's first ever vinyl release, they released a limited number of Burial Ground first pressings on the New York Rock Exchange. SEE ALSO: Burial Ground is the first NYRE share issued by the Reggae band Stick Figure. It was released as a Collector's Edition for the double vinyl album Burial Ground--the band's first ever vinyl release. Both Silver and Gold shares were offered. Gold shares included a limited edition autographed first pressing of Burial Ground vinyl. In addition, a limited number of Silver shares were released without vinyl. All shares included an online shareholder meeting with Scott, Kevin, Tommy and KBong as well as a free download of the song "Smokin' Love". Post release, Stick Figure has provided a couple "bonus dividends" to shareholders. On August 5th 2014, shareholders were sent a link to download the song "Livin' It" and on Dec 11, 2014 they were sent a link to download a free reggae remix of Sam Smith's "Stay With Me". 150 RELEASED. Each Gold share included an autographed first pressing of the Burial Ground double vinyl album, an autographed gold foil embossed NYRE certificate, an online shareholder meeting with Stick Figure, and an MP3/WAV download of "Smokin' Love". 25 RELEASED. A limited number of Silver shares were issued without vinyl. Each Silver share included a foil embossed silver New York Rock Exchange certificate, an online shareholder meeting with Stick Figure, and an MP3/WAV download of "Smokin' Love". New York Rock Exchange songshares are not securities, and do not provide a financial interest in the song. For more information, please check out our FAQ. The Stick Figure online shareholder meeting took place December 11, 2014 at Scott's house. Scott, Kevin, Tommy, and KBong answered questions, free-styled, and gave a tour of Scott's studio. Burial Ground was the first New York Rock Exchange share released for an album, rather than an individual song. The New York Rock Exchange helped make the Burial Ground album possible by fronting half the money required to produce the vinyl as part of our deal with Stick Figure. Original painting from which the share certificate and album artwork was derived. Thank you to @christie1300 for demonstrating how to properly showcase a NYRE songshare! Join the wall of fame by sending a photo of you and your share to shareholders@newyorkrockexchange.com.